For much of the last thirty or so years attending a Yes concert has been a bit like going for a McDonalds: you knew exactly what you were going to get, but not who would be serving it up. For the latest newbie to join the ranks of Yes, Jon Davison, is by my reckoning at least the 17th musician to have been a member of the band. And in my more cynical moments I occasionally wonder if he replaced previous vocalist Benoit David not because he sounded any more like Jon Anderson (he doesn’t, both are able to do passable impressions), but for the fact he also looks not unlike the original vocalist – something the squat David most certainly did not. There was no new album to promote with this tour; so rather we enjoyed an unashamed nostalgia bash, with the band choosing to play three of their best known 1970s albums in full, and in running order. Close To The Edge was first up, with both the title track and And You and I suffering a bit from both over-familiarisation on my part, and what appeared to be a slightly reduced tempo. Davison did make a decent fist of the vocal parts on both I noted, and I also was pleased to hear Siberian Khatru live for the first time. The Going For The One album was next, with Davison less successful during the gentle Turn Of The Century, his voice really lacking the deftness Anderson brought to the original. Awaken, which closed the album (and the first half of the set) was a pleasant surprise, coming alive as it never seemed to do on vinyl. I loved Chris Squire’s silly three-necked guitar, and Davidson nailed the thing perfectly. Even Wife, no great lover of Yes, thought it sounded "quite majestic". After a break we were into The Yes Album, with Starship Trooper and All Good People getting the crowd to their collective feet. But then we hit the inevitable problem all bands face when choosing to play classic albums track for track: what to do with the fillers. Yes here chose to plough on, with the consequence all atmosphere in the place died as we endured the clunker that is A Venture. Even Geoff Downes’ embellishing the piano outro failed to save what is probably the only real dud in Yes’ pre-Tormato back catalogue. Still Perpetual Change and then an encore of Roundabout saved the day, even if Steve Howe’s guitar appeared to disappear from the mix for much of the former. It is hard really to criticize these guys musically, for even though the three stalwarts of Howe, Squire and Alan White now boast a combined age of close to 200, their musicianship shines through. They could all benefit from decent haircuts though. Driving back home (via McDonalds? 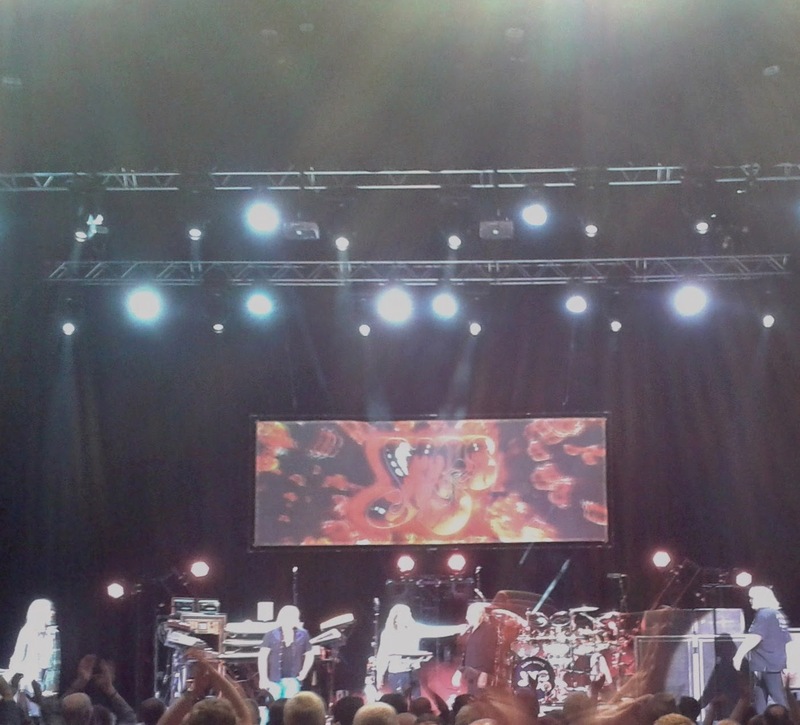 ), it struck me with a bit of a jolt that I have now seen Yes perform on four occasions - every time with a different vocalist!